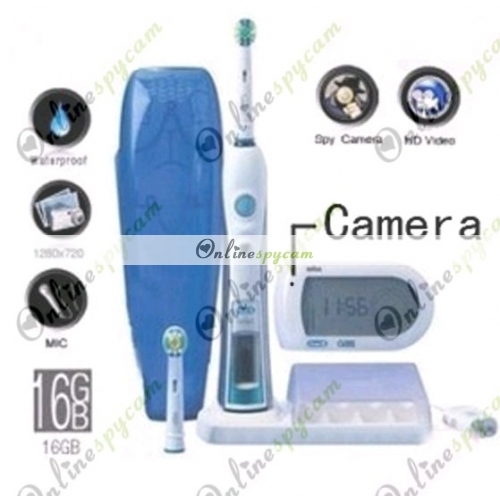 Compare to the other Spy Toothbrush Pinhole Cameras, the Intelligent 3D Electric Spy Toothbrush Pinhole Camera has more powerful functions. Its appearance is more elegent. It remains the brushing function so well and it has five brushing modes which can help you protect the teeth better. Meanwhile, as a spy camera, its 1280x720 resolution makes it record videos so clearly. In addition, its 16GB memory card which is built inside and the large capacity battery help its recording time last quite long, about 8 hours or above. When you want to record something exciting, you don't need to guard it. Just go ahead to do your own things. Later on you can appreciate the vivid video with clear voice on your PC or some other suitable players. You needn't worry about others could find the camera. It is so tiny and the position is so covered. No one will notice this bathroom pinhole camera even when it is working. If you want to get something unnoticed, this high-technology item will be a good tool. 1. Wireless interactive intelligent navigation displays help to develop better brushing habits. 2. Five brushing modes: Clean, soft, massage, polish, the reform of three minutes deep clean mode. 3. 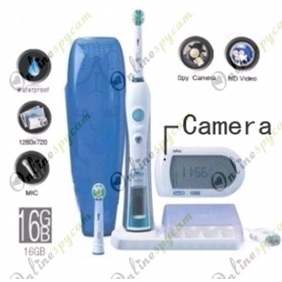 Personalization timer: the teeth brushing time is divided into four-way partition limit. 4. Two minutes timer: close timer function, do not brush your teeth into a time when the active display. 5. Brushing pressure display: reminder to avoid excessive force when brushing your teeth. 6. Replace the brush head display: time to record personal brush with the proposed replacement brush habitual. 7. 3D-style front and rear shock pulse / rotation back and forth about technology. 8. Before and after the acoustic pulse 40,000 times per minute, the plaque can cut off the hair, loose teeth plaque. 9. Turning left and right turn times per minute, 8800, will completely remove loose plaque. 10.Built-in interactive Ling Rui chips: built-in smart chip, with the handle of the electronic components to exchange information. The only chip that can be automatically selected for you applying the brush teeth cleaning mode.